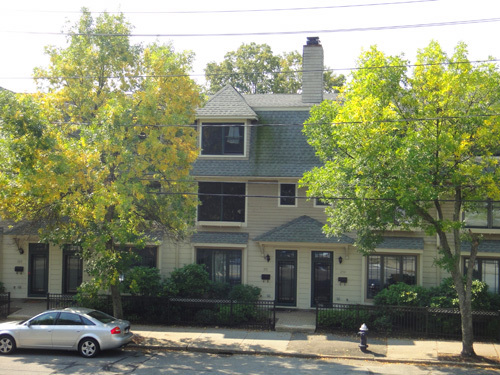 It's a little less green and has a few fewer leaves every day. (Not that it ever had that many!) The leaf pile below is certainly growing. I wonder just how long it'll take for all the leaves to fall. A month? Longer? Start the clock! It's happening! 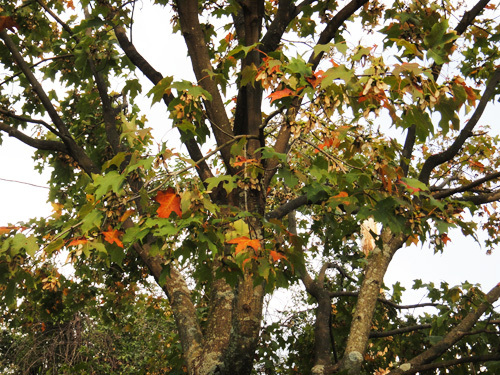 Leaves are beginning to fall from my tree! 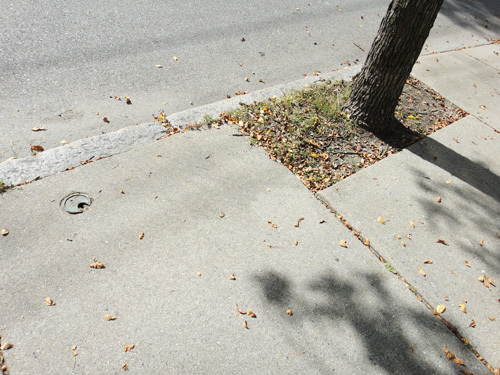 Here's the sidewalk area beneath my tree three days ago on September 23rd. 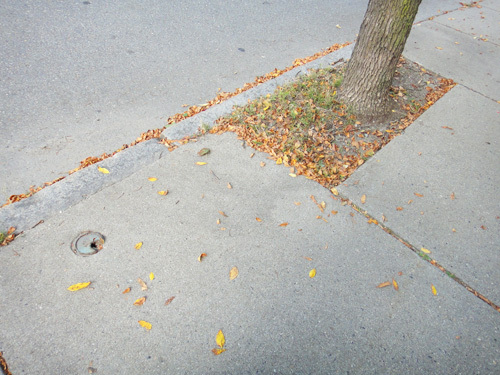 This was one of the first days that I really noticed leaves accumulating beneath the tree. Saturday story time is back! 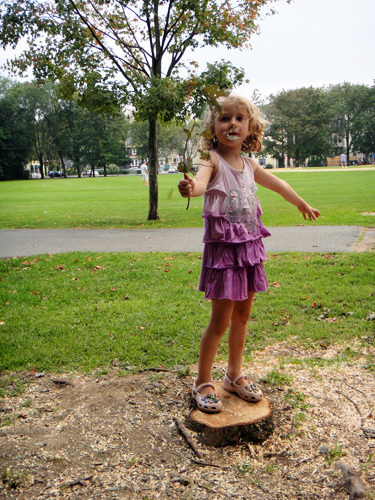 When we visited the Arnold Arboretum in June for family fun day, they had crafts out for kids to do. One of them was organized by local artist Leslie Evans. 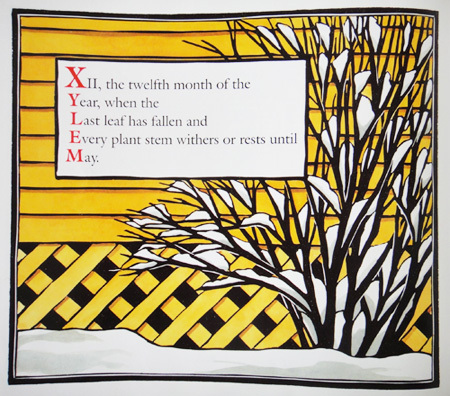 Her beautiful prints are featured in many books about nature including a series of alphabet books based on the seasons written by Steven Schnur. Since we've been enjoying the first colors of fall this week, I thought we'd look at Autumn: An Alphabet Acrostic . Okay, isn't the cover amazing?! The lines are so sharp and crisp and the colors are so rich. I just love Evans' work! In the autumn book, every picture contains the yellows and oranges we associate with the season, whether it's an orange moon, a bright yellow house, or the beak of a barn owl. The book is organized like an alphabet book. 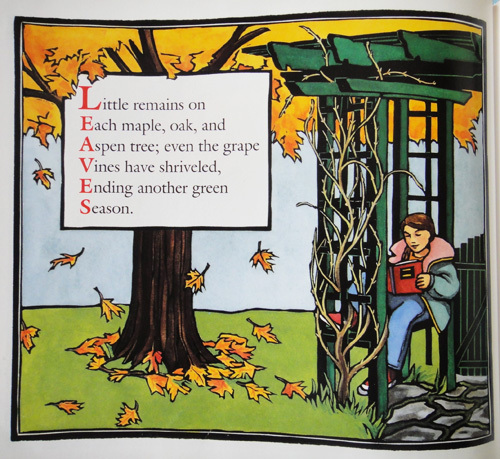 There is an autumn word on each page that starts with the next letter of the alphabet. 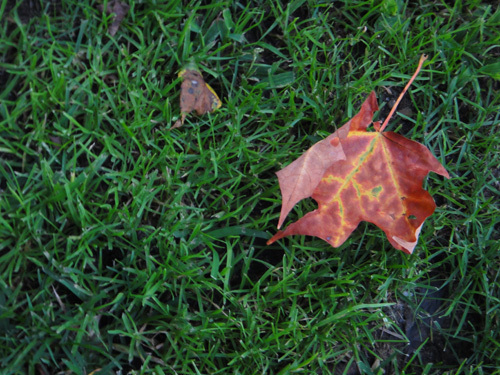 Here L is for Leaves (which comes after Knit and before Mouse). But the book is more than an alphabet book, although it could be read that way for younger kids. Each of those alphabet words also provides the structure for an acrostic poem, where each line begins with the next letter of the word. Who doesn't love a cool acrostic, huh? 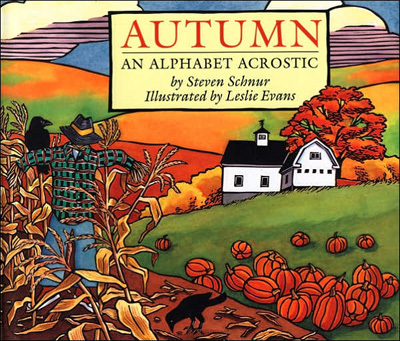 Kids would have so much fun making their own acrostic poems for the fall inspired by this book! There are of course, three other books in the series corresponding to the other seasons. 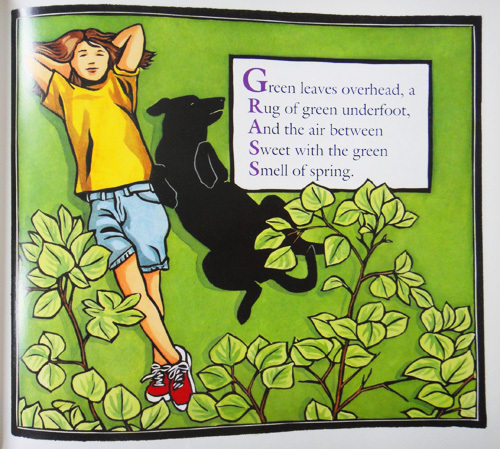 Spring has bright greens on almost every page, for obvious reasons. And again, the poems are delightful. 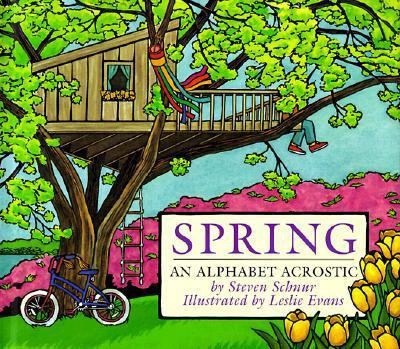 I like all the long e sounds in this one, ending with spring itself. In Summer, the greens become blue-greens of lakes and beaches and night skies. I'm waiting to take a look at Winter until that season arrives here! But we get a little preview of it in Autumn. 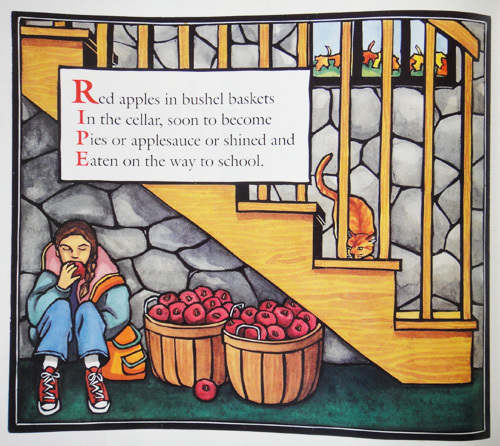 Now, in my opinion, one of the true tests of an alphabet book (because it is one of the true challenges), is how the author deals with the letter X. Schnur uses some clever tricks to get around X in the books and this one is my favorite. The word xylem is so cool! And the roman numerals could lead to an interesting math discussion in class as well. I'm am so getting a set of these books for my future classroom! There's great science in here, fun word work and writing modeling, and a lot of connections kids can make between their own experiences and the books. PS - If you want to see more of Leslie Evans' amazing work, check out her website Sea Dog Press. 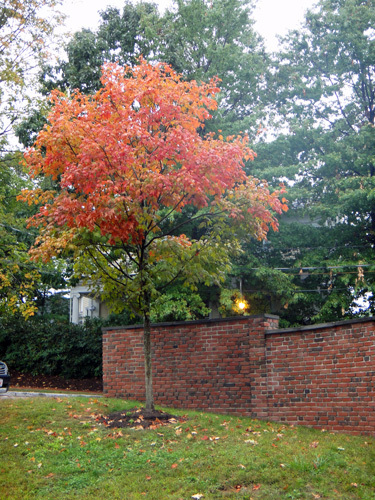 Tomorrow is the first official day of fall, but the maples and the ashes haven't been waiting for the calendar to change. The ashes have been particularly interesting to watch because the changes so far seem to be different for the boy and girl trees. 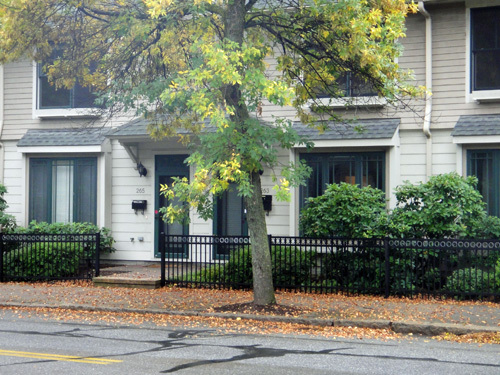 Here's a picture of three ashes across the street. 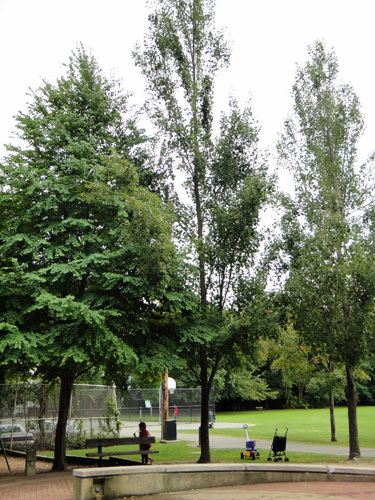 The one in front is a male ash tree and is still almost entirely green. 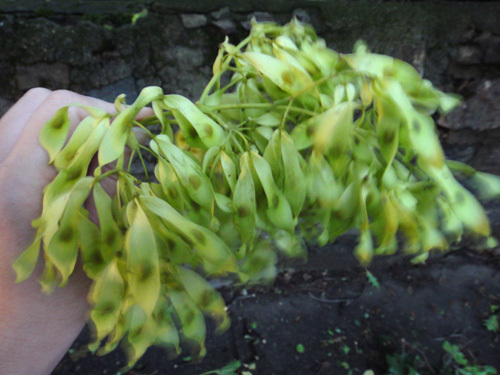 The one in the middle had both male and female flowers and is yellowing only in certain areas (the girl parts??). The last tree in the group is the girl. She started yellowing long before the other two and has orange leaves now. 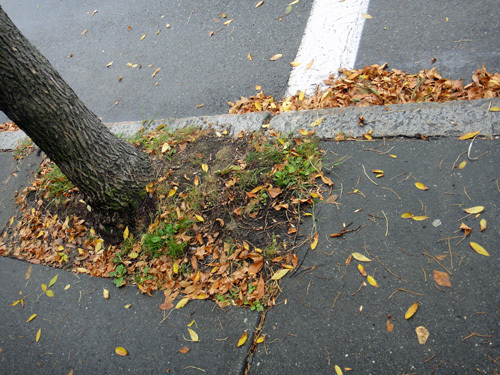 In fact, she's so far ahead that she also has a litter of fallen leaves beneath her! There's nothing under the male trees. This reminds me of the spring, when the boy trees dropped all their polleny flowers everywhere and were surrounded by droppings, but it was nice and clean under this girl tree. I guess it's her turn to be messy now! 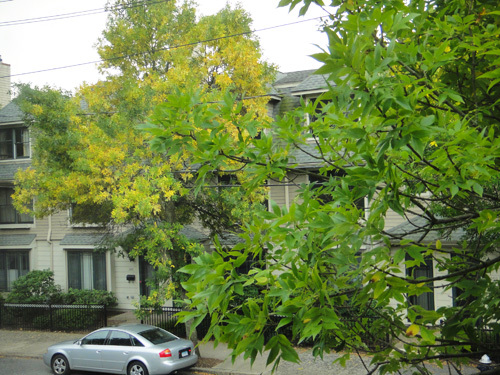 Farther down the street, the handsomest ash in the neighborhood is starting to yellow. He has by far the fullest canopy of all the ashes around and was early to get his leaves. He's also on the earlier side amongst the boys to start changing colors. Hmmmm, interesting. As for the girl down the street, who I've been following since she started making fruit in May, she's way ahead of any of the ashes around our house. She has lost so many leaves! She's still holding on to her seeds though. Wait, I think there are some of them down below, hidden among her leaf pile. So is the tree losing everything all at the same time? Leaves and seeds? Oh boy! And, last but not least, my tree. There were a few signs of early yellowing that I spotted last week. 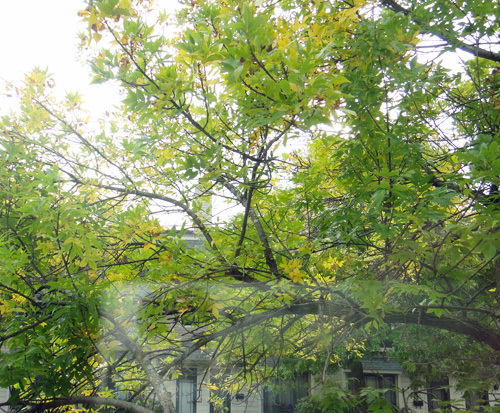 A few leaves up close to the window and an entire twig out farther away over the street. And today, he looks ready for fall's official arrival tomorrow. The green is fading. The yellow is coming. 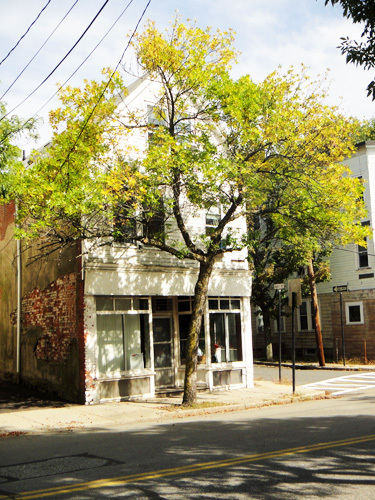 (From the street side...I wonder if that's important.) Seems like my ash trees are very punctual. The flowers started to pop out of the buds on the very first day of spring and now the leaves are changing colors at the very start of fall. I like that in a tree. 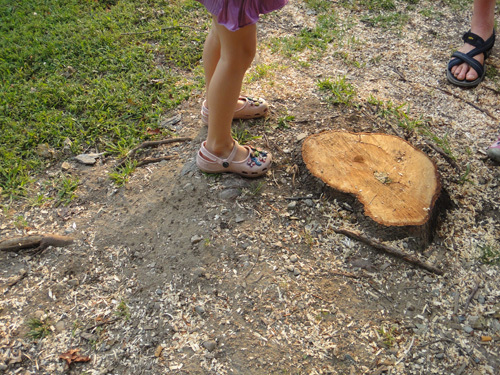 So we were on the way to the playground last week and some neighbors told us to watch out for one of the trees. It was leaning. Oh yes, that is definitely not how that tree used to look! 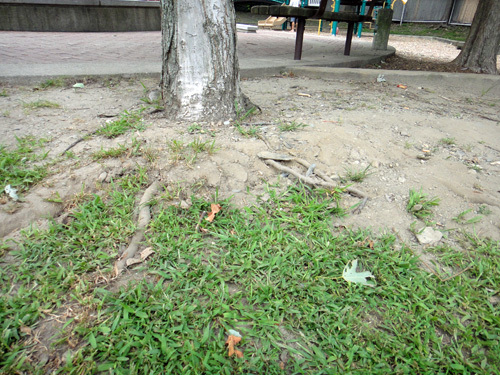 And when we looked down at the ground beneath the tree, we could see the roots coming out of the ground. Uh, those were not there before. It looks like the tree just can't hold on anymore. OK, people, do not stand here! That middle tree is gonna go down and it's coming this way! Evacuate! 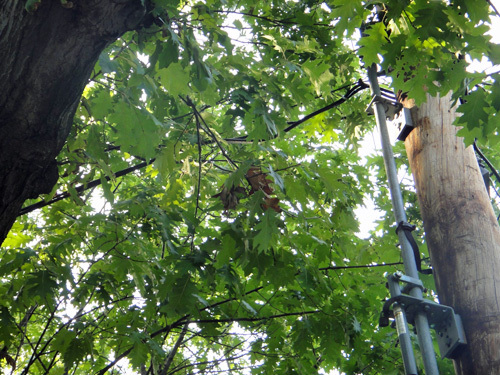 The neighbors mentioned that they had called the police, who told them they weren't tree people and didn't have any police tape to rope off the area (what, they don't carry that stuff around? ), so there was nothing they could do. So we all just played on the playground and hoped that a predicted storm that night would knock it over. 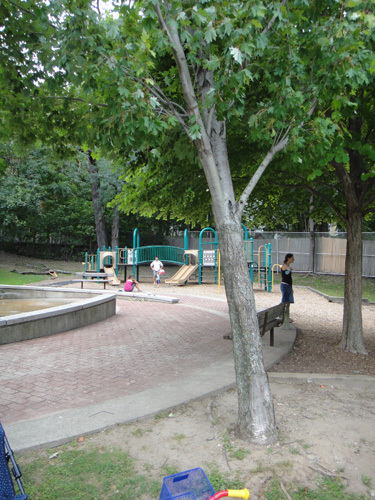 We didn't make it out to the playground for a few days, but when we returned there was no more tree. No storm did that. 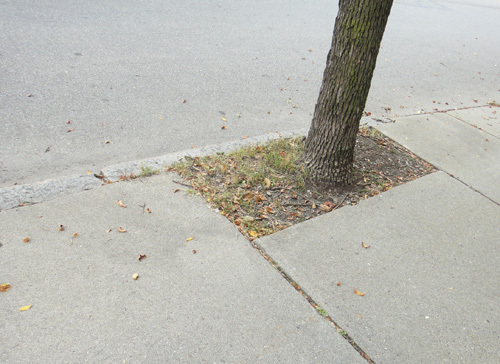 Looks like "the tree people" (maybe the Department of Public Works?) came and took care of the problem. But what do we do with one less tree? My daughter had an idea. 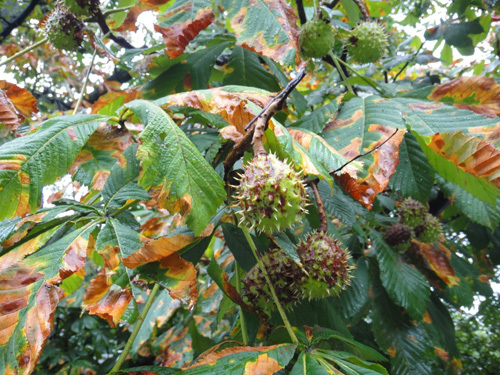 Elsewhere on the playground, I spied some other signs of a fall coming: RED! 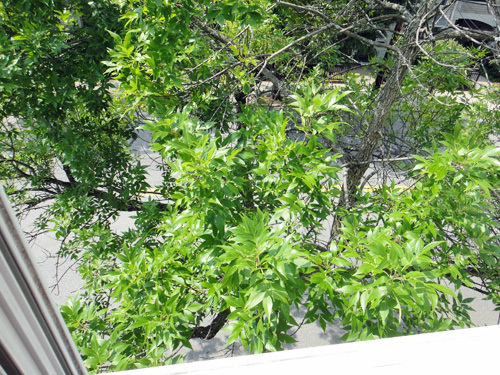 I'm still considering my options for tree watching since the men with pointy sticks came and cut down all the branches that I could reach from my living room window. I realized that I can also see my tree from the upstairs bedroom. But how well can I see things and how close can I get to the branches? So this is the view from upstairs. Things are kind of far away. And there's the whole looking down/vertigo thing going on. 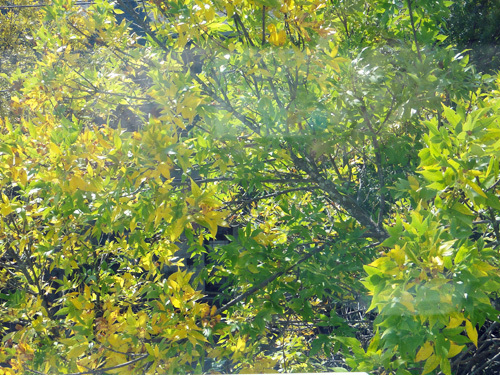 But with a little zoom on the camera, I can get a good picture of some leaves. And if I lean waaaay out the window, I can even reach a twig to take a close-up. 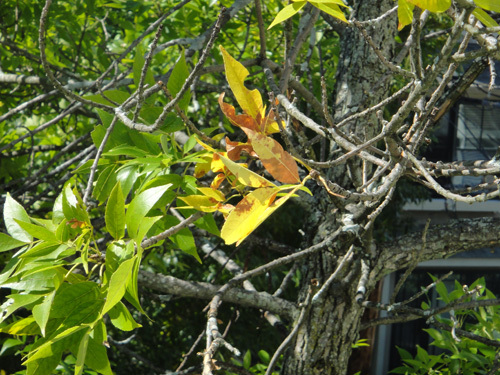 So this is what my tree's twigs looked like at the end of August. Since then, we've had a dramatic change in the weather. 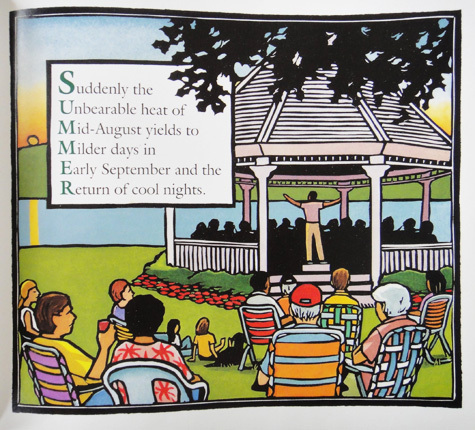 It seems like the sun sets almost an hour earlier now than in mid-summer when we returned from vacation and in the last couple of days the temperatures have dropped about 20 degrees. I wonder what effect this will have in the slow yellowing of my tree. Will it speed up now that the light has changed and the temperatures have dropped? It sure does feel like fall. 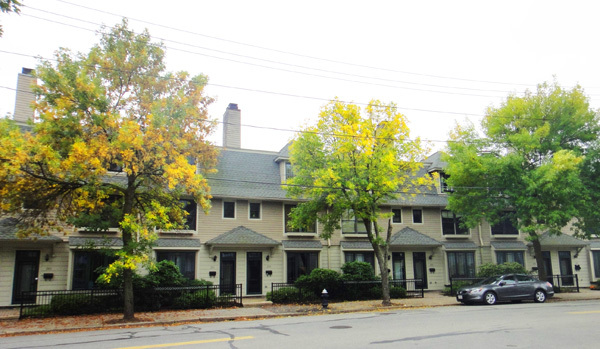 When will this tree start looking like fall? The question still remains, what I am going to do now that the men with the pointy sticks have cut down all the branches and twigs from the tree that I've been watching since February. I can't reach any of the twigs on the tree outside the window any more and I can't see anything up close. Fall is coming and I want to watch! 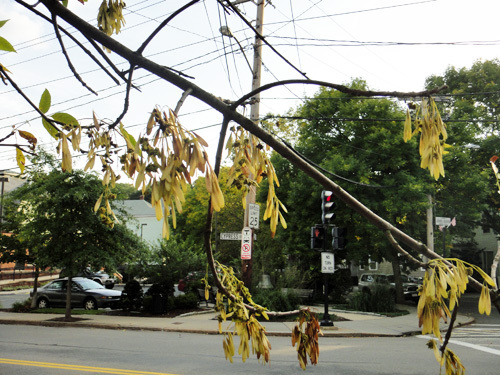 My first thought was to take a look at some of the other ash trees in the neighborhood to see if any of them had some low branches that I could actually reach and examine closely. 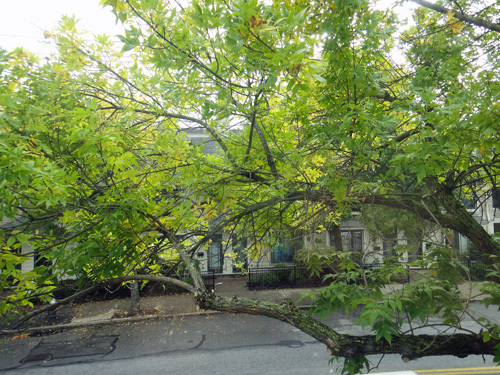 But the girl ash tree across the street does have a few branches I can get to. Interestingly, some of the features on her twigs are quite different from those on the twigs of my boy tree. 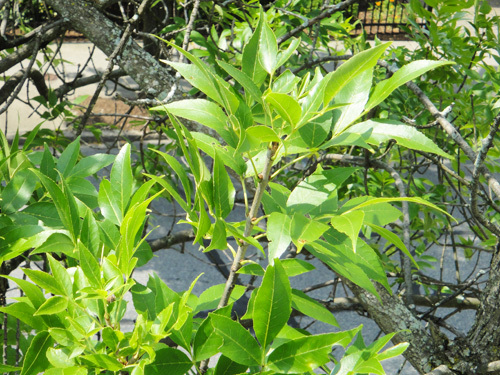 The first difference I noticed was that this year's growth (the lighter colored bark extending up from the tip of the twig down to the first "knuckle" or ring-like bud scar) is much longer. Like four times as long! I wonder why she managed so much more growth than my tree did. 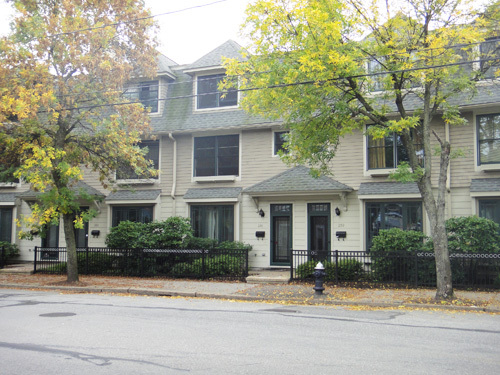 Does it have something to do with the side of the street? Does this side get more sun? 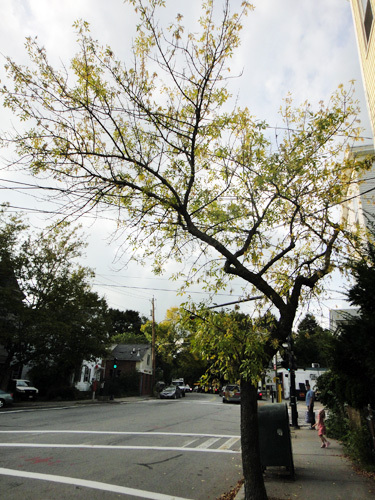 Or is this tree maybe healthier? 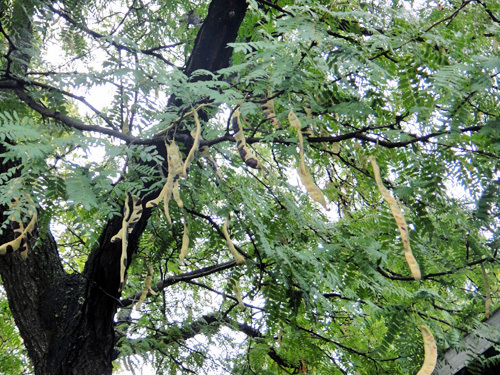 Or is it because it is a female ash tree? 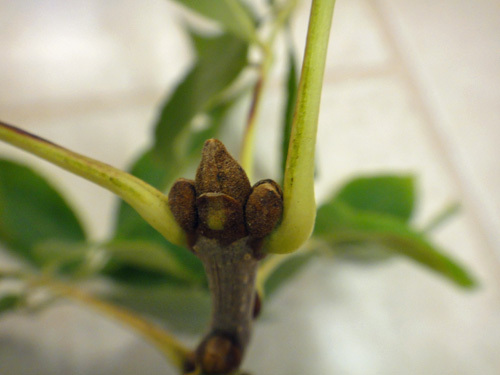 Another thing I noticed was that the developing buds on her twigs are much smaller than they were on my tree's twigs. 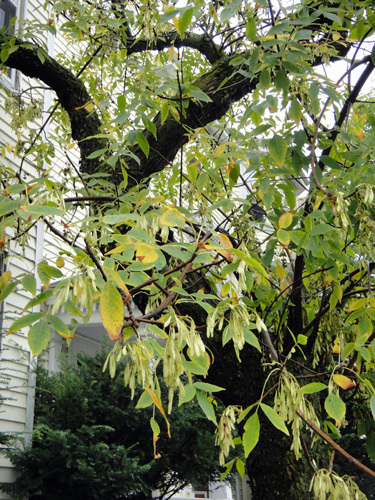 Just try to find the lateral buds on the female ash tree! 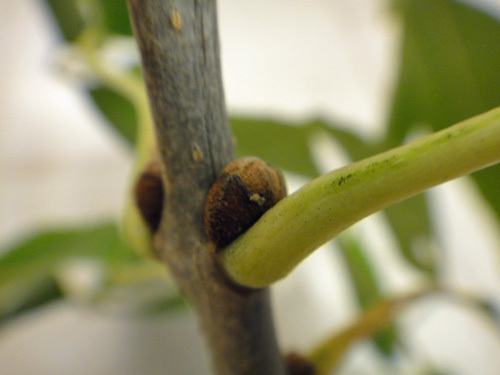 The lateral buds should be developing right above the spot where the leaf stem joins to the twig. Um, where are they? 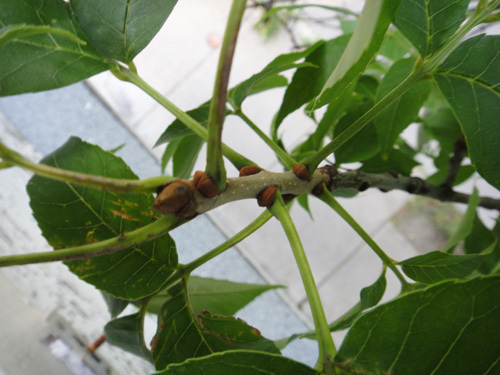 My tree already had big, fat buds that I speculated were close to being done developing. Look, here's how they looked on July 21st, when we came back from vacation. See! Is this a boy/girl thing too? I'm thinking it might be. 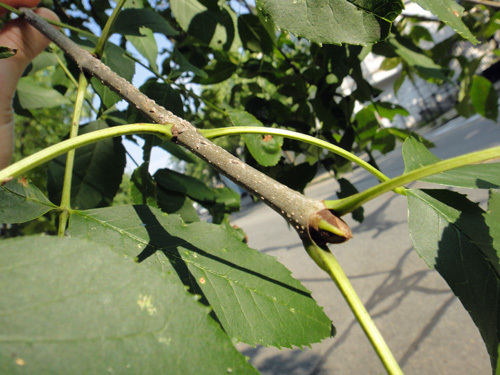 Last week, I picked up a twig that was blown off of another boy ash tree down the street during Hurricane Irene and look at the buds on this guy! 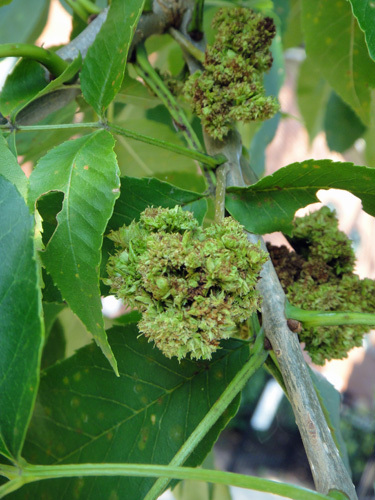 Apparently while the girl ash trees are making like 5,000 samaras and seeds, the boys are developing these big fat buds. Hmmm, maybe the boy buds and girl buds are just different. I mean the boy buds have to make those flowers and all that pollen, so if the girls don't have to do that, maybe they don't need to make giant buds like this. 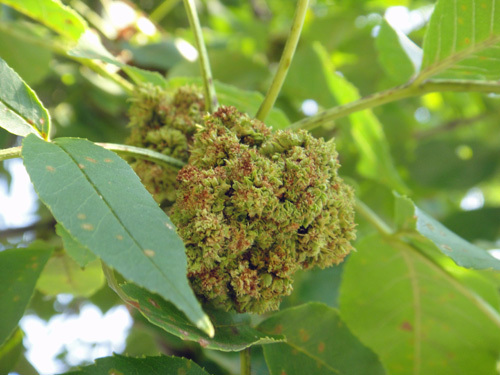 Speaking of boy stuff, remember how I found those sticky burr things on my tree way back in February and figured out that they were galls created by tiny mites growing in and feeding on the male ash tree flowers? Well, I never saw any new ones develop on my tree, but during my examination of the other ashes in the neighborhood this week, I discovered that a couple of the other boy ashes developed some new galls this spring. See how they're green instead of the brown that the galls were on my tree? They're this green color in the season when they first develop. 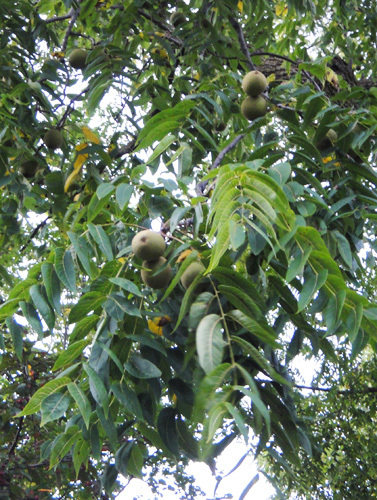 Then they turn brown and stay on the tree for a year or two. It's kinda gross to think that this tree had (has??) tiny bugs in it that made these. Ewwww. I wonder why there were (are??) 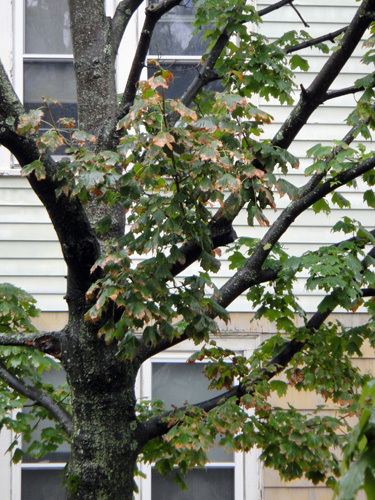 so many of them on these trees across the street but not on my tree. One more fascinating thing about this discovery. The tree that I found these on is a boy and a girl tree. Some ashes are like that, producing both girl and boy flowers. 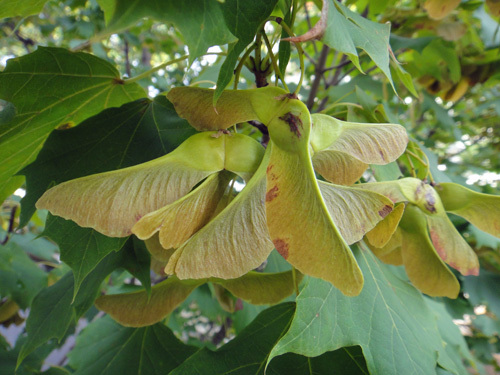 So this tree has areas where there are lots of samaras and then also areas like this where there are galls (which develop only in male flowers). 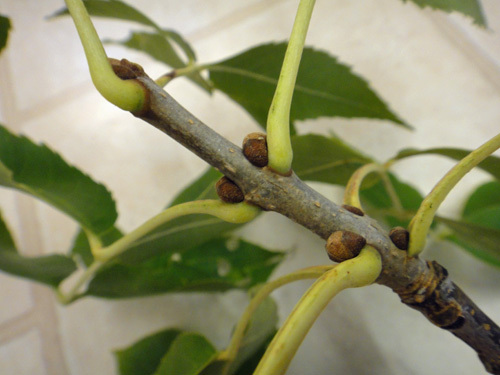 And, if you look real close, you can see that the twig that these galls are on has big lateral buds growing right where the leaf stems attach to the tree. Well, I'll be darned! Last weekend, we went to New York City to visit grandma. While we were there we decided to make a trip to the site of the World Trade Center. I thought that this weekend, on the 10th anniversary of the attack on the Twin Towers, I'd show you a little of what I saw there. Giant waterfall features have been built in the spaces where the two original towers stood and the entire space around them will be filled with trees. The website says that there will be over 400 trees on the 8 acre plaza and they will symbolize "hope and renewal." 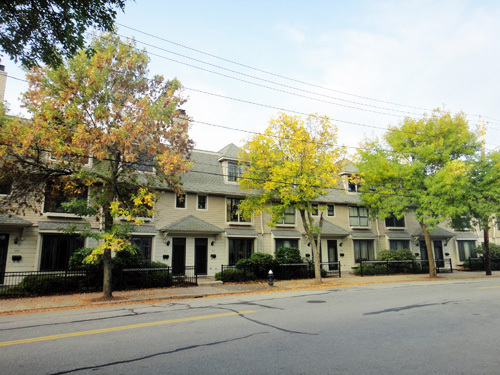 Check out some images of how it will look when the trees are grown and in bloom on their gallery page. Like Central Park, this will be a huge green area surrounded entirely by tall buildings. I feel like the trees bring the city back to a human scale and are a perfect way to establish a space where the human beings who died at the World Trade Center in 1993 and 2001 and at the Pentagon and in Pennsylvania can be remembered. The memorial won't open to the public until September 12th, so we visited an exhibit a few blocks away called Tribute WTC: Person to Person History. 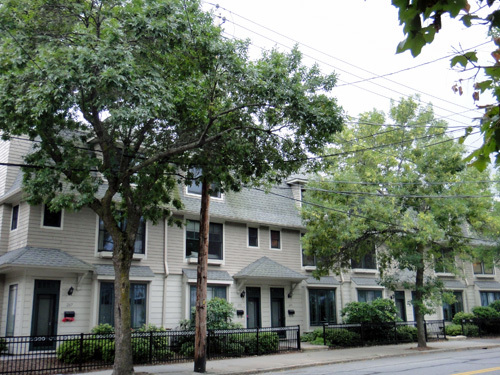 Here we read about the neighborhood before the attacks and saw images and heard stories of what happened that day 10 years ago. I have to say that we hurried through this section, because it was our sons' (who are 10) first time looking at some of these images ever and a little really went a long way. We spent most of our time in the lower gallery where there was information about the memorial and artwork that kids and people had made to remember. Hanging over the stairs leading down to the downstairs gallery are 10,000 folded paper cranes made by Japanese families and friends of the Fuji Bank employees killed in the attack. My kids are familiar with the paper cranes. The story, Sadako and the Thousand Paper Cranes , is one kids often hear about in school and cranes are often made and sometimes sold to raise awareness and money for various causes. 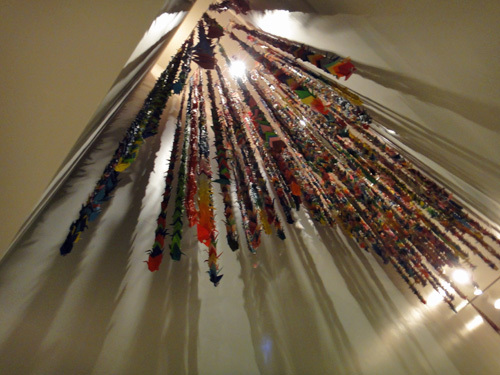 In our school last year, students and families made paper cranes to remember the victims of the Japanese earthquake and tsunami. Downstairs, there were many pictures of the planned memorial site. 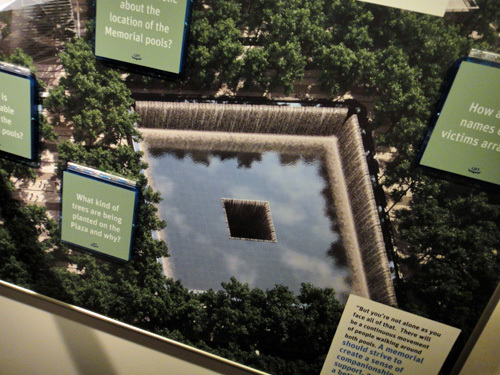 This one had many interactive flaps that helped kids think about the memorial and what it is meant to symbolize. 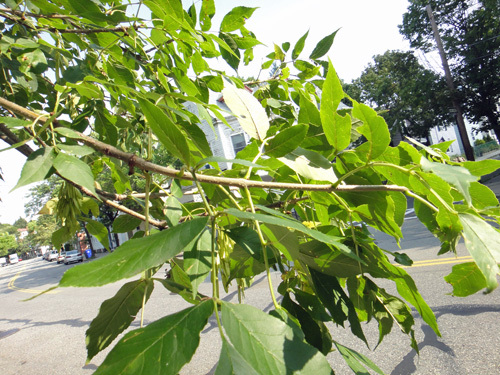 One flap asked, "What kind of trees are being planted on the Plaza and why?" 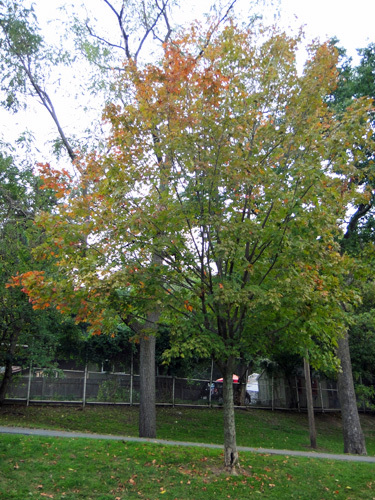 The answer: "The 400 Swamp White Oak trees were chosen because each tree's leaves change in the fall to colors ranging from amber to golden brown, and even pink. 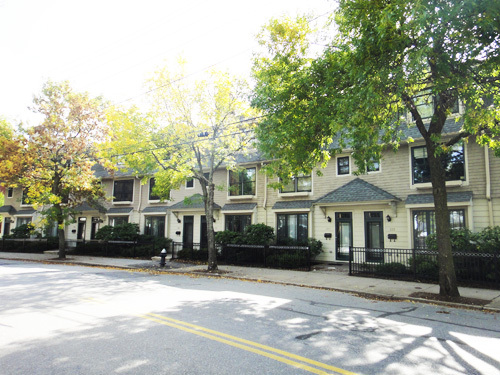 The trees are never identical, neither to each other nor from year to year." 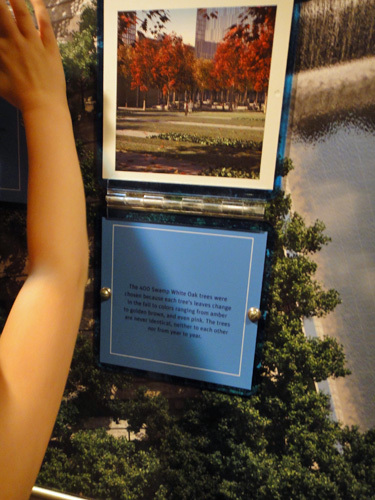 The 9/11 memorial website explains that the trees were selected from areas around New York, Pennsylvania, and Washington, D.C. The Swamp White Oaks with their unique colors reveal the individuality of each individual tree and each individual life memorialized here. Another striking artifact in the gallery was this tree collage. 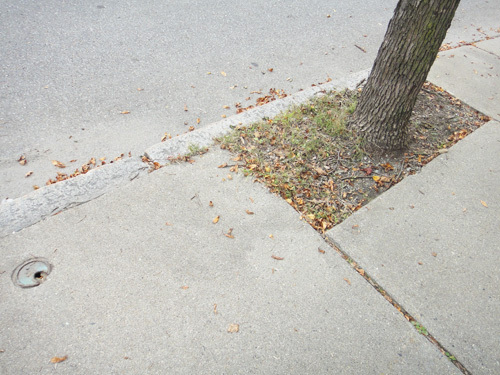 The image could be an explosion, it could be cracks, but the artist explains that it is meant to be the form of a tree. 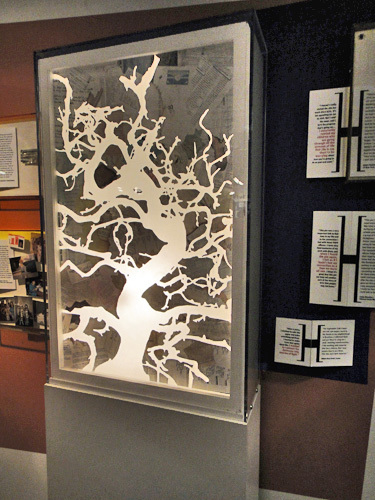 The tree is made from light filtering through empty space left between a collage of papers. 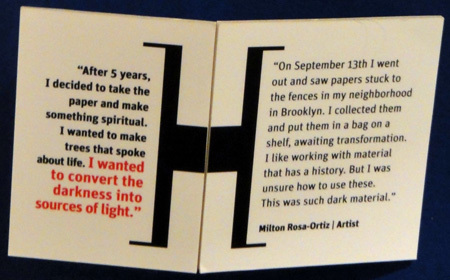 These are papers that the artist found littering the ground two days after the collapse of the Twin Towers. For some more words from the artist, check out this article about artifacts in the Tribute WTC exhibit. The Tribute WTC website also has many education and teacher resources and a thoughtful Q&A page about how to discuss 9/11 with students. 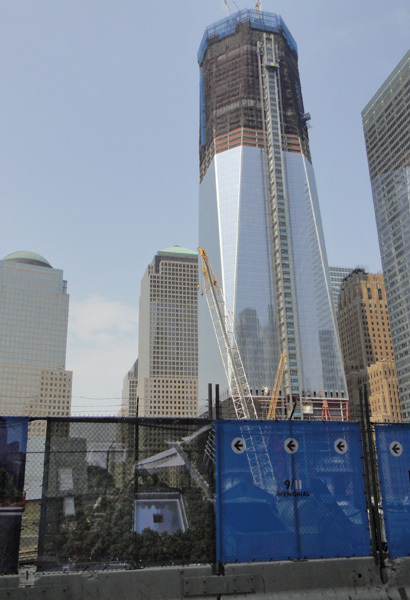 You can also follow the progress of construction on the new One World Trade Center building at The New World Trade Center: Rebuilding the Future, a website by the Port Authority of New York and New Jersey. I've got boys in fifth grade, so I notice these things. But I'm talking trees. Check this out! 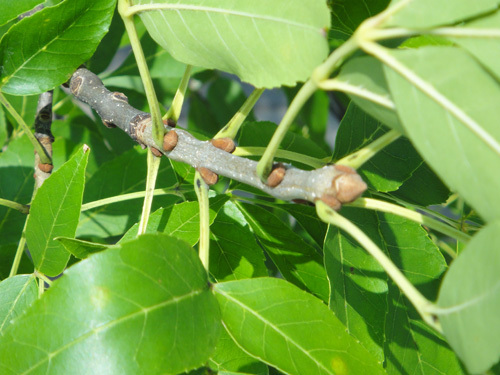 The ash trees around the neighborhood are once again revealing their gender. 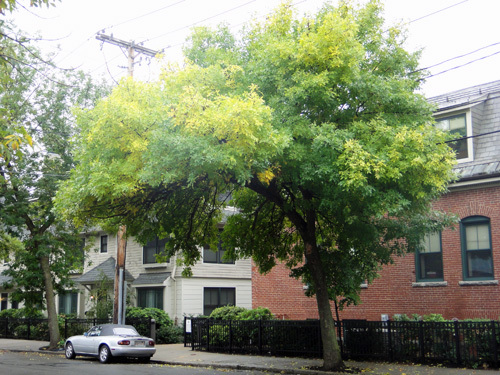 The boy ash trees, like the one on the left of this picture, are still deep green in color, but the girl ash trees, like the one on the right, are much lighter now. Neat, right? If we look closer, we can see that some of the lighter color is coming from the large clusters of fruit that are hanging from the branches. They were always this paler green color. But that's not all that's causing this effect. 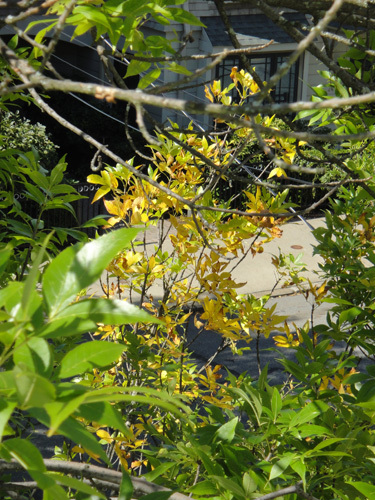 A lot of the leaves on the female ash trees are turning yellow now. This is just not happening yet on the male trees. So what's going on? 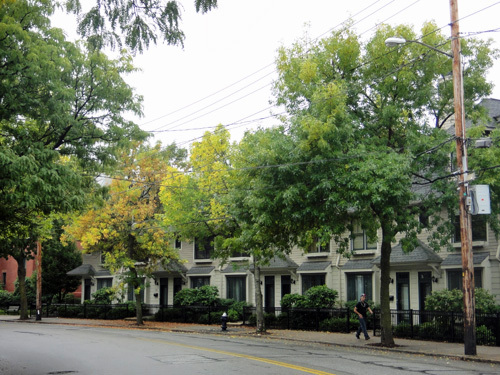 Are the female trees really going to change sooner and maybe even lose those leaves sooner? 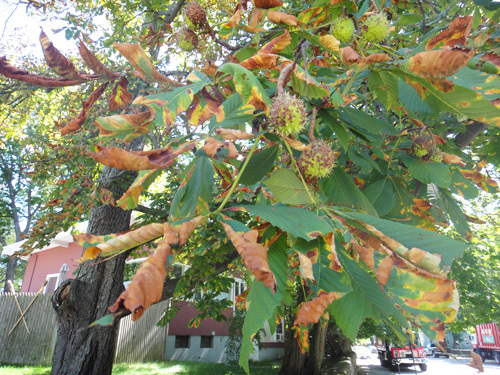 Is the difference due to the fact that these trees are using up more nutrients to develop those samaras and seeds? 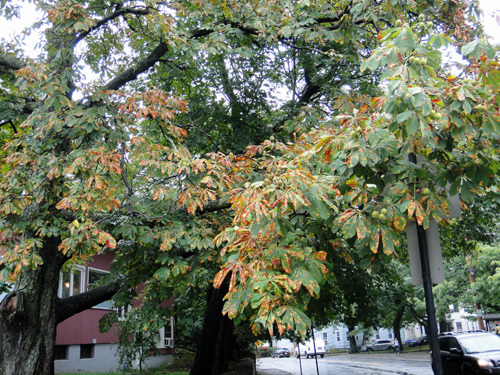 Also, this might be a coincidence, but in my neighborhood all the female ash trees are smaller than the male ash trees. I wonder if the seed production might affect their growth. Wow! 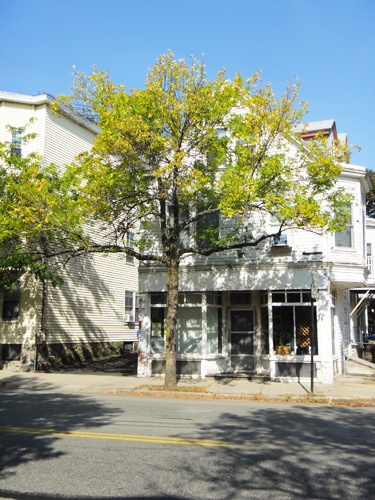 Look at the changes happening on the chestnut tree down the street! 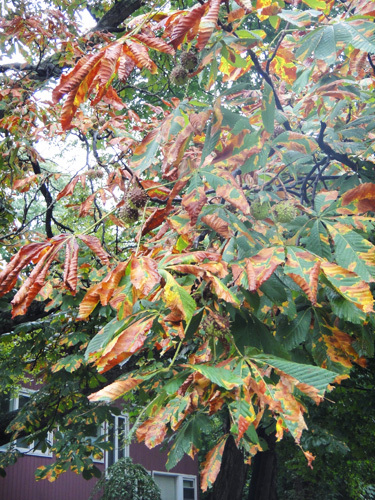 Not only are the leaves changing colors dramatically, but the chestnuts are too. 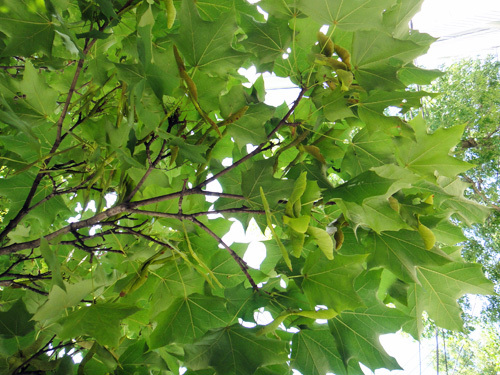 They are now spotted with the brown color that they usually are when they finally fall from tree. 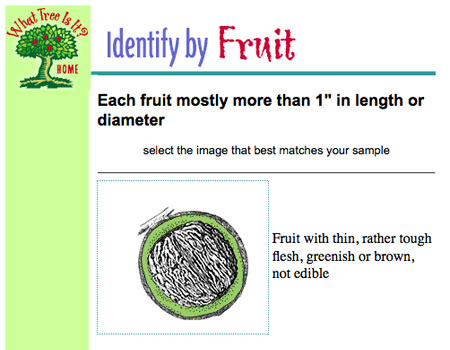 It's so fascinating how this is happening in blotches and splotches all over the leaves and fruit. And I'm amazed that the transition is so striking. There aren't any inbetween colors, just the green and then big brown bits. This tree is so freaking cool looking right now, I can't contain myself! The maples around us were the first to start flowering in the spring. It seems they will be the first to start changing in the fall as well. Wanna watch? 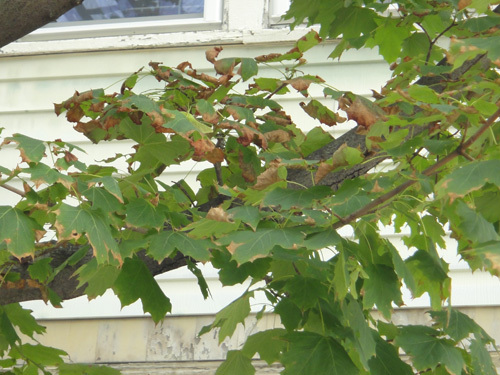 Here's a picture I took of a maple on August 1st, shortly after we got back from our vacation in Germany. I was checking in on the progress of the keys and didn't notice any color changes in the leaves. By August 16th, the wings on the keys had turned a golden brown and the green in the leaves had started to fade as well. 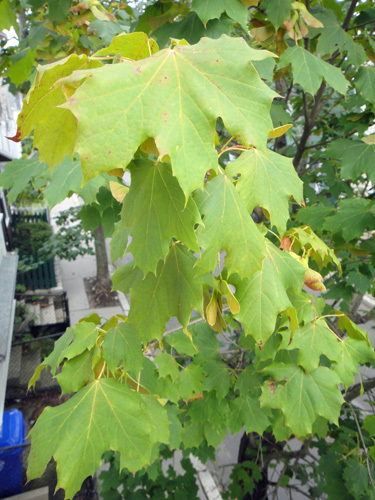 On August 26th, I spotted brown edges on some of the maple leaves. And this morning, when I sent my boys off on their first day of school, there was even more brown. Oh yes, change, it is a comin'.